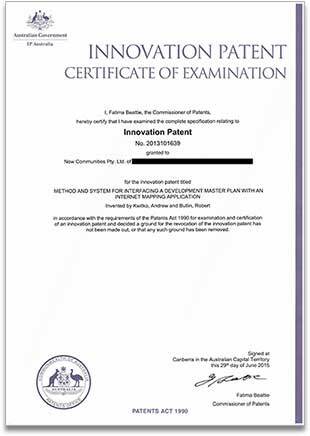 MAPOVIS holds a certified Australian Innovation Patent (#2013101639) for the "METHOD AND SYSTEM FOR INTERFACING A DEVELOPMENT MASTER PLAN WITH AN INTERNET MAPPING APPLICATION". Please contact us for any patent related enquiries. © Copyright 2014 by MAPOVIS. Australian Innovation Patent #2013101639. Learn more.